A dog might need booties because of weather or other reasons. 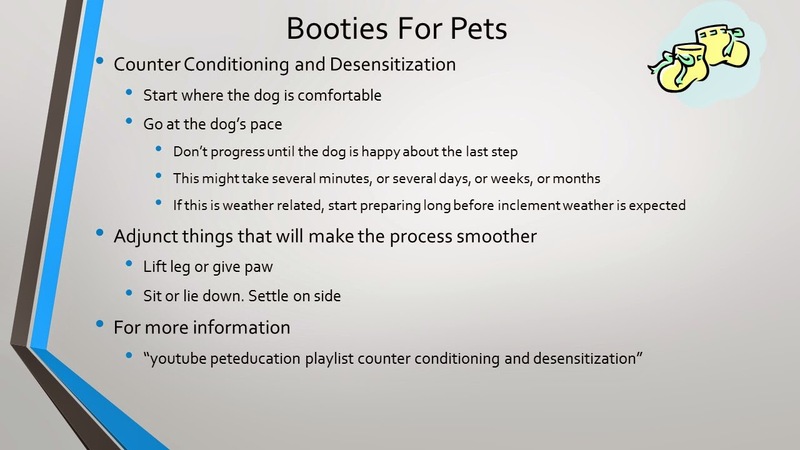 If a dog is uncomfortable wearing booties or having them put on his/her feet, pet guardians might be able to make the process a little bit easier with desensitization and counter conditioning. until we see our dog is looking forward to the handling. If the dog is uncomfortable, then we try something easier like just reaching or just approaching. Once we can handle the feet, then we might start with something really easy on the foot like some light weight gauze. Once the dog is happy about the gauze, then we can try a slightly heavier item like a bandage. Then something like booties but easier to get on, like a large human sock. Eventually we work our way up to booties. Once they are all on, don't ask the dog to walk yet. Hang out, play some games on the floor, feed treats, ask for some tricks that don't require him/her to get up, etc.. Just try to keep the dog's mind off the booties for a little while. Some adjunct things that will make the process smoother - Teach the dog how to shove his/her feet into the booties (the less handling, the better). Teach the dog to lie or sit in a comfortable position while the booties are being put on. Unless it's an urgent situation, don't rush the process. If the dog wants to walk off or resist, just let him/her. Take that as information to break the process down further next time. If process doesn't seem to to be working, get a vet assessment for pain or see if pain management might be helpful. Ask for help from a professional who is well skilled in counter conditioning and desensitization. The dog might also need the assistance of a board certified vet behaviorist. Tell us about your favorite brand of dog bootie in the comments section below.